I have to admit that I was a little apprehensive about this little trip. 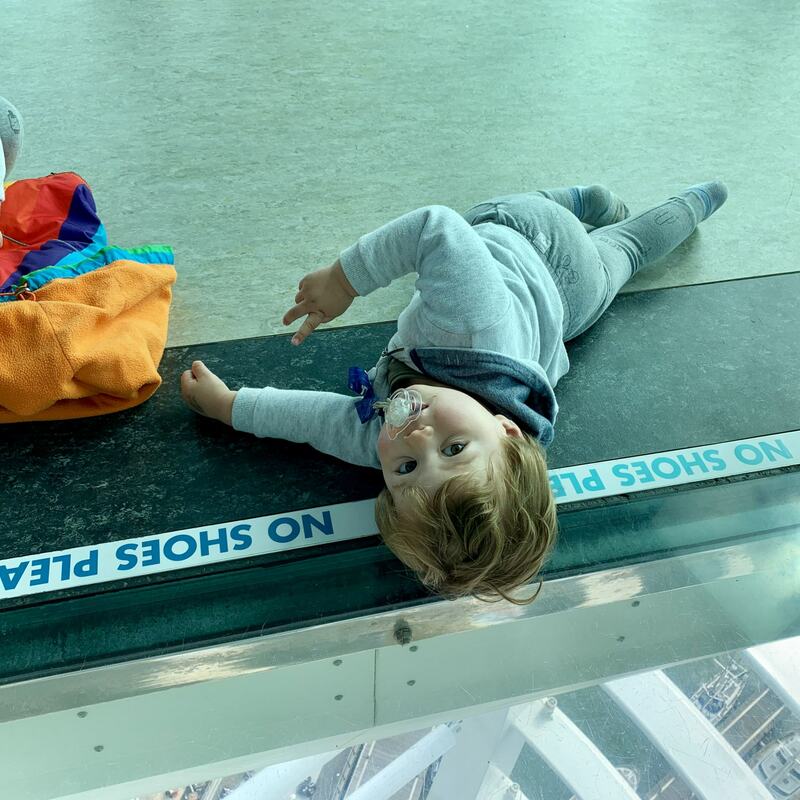 I had looked online about things to do with the kids in Portsmouth and the surrounding area so that we had something in mind for our little two day stop off before we headed to Our Isle Of Wight trip. 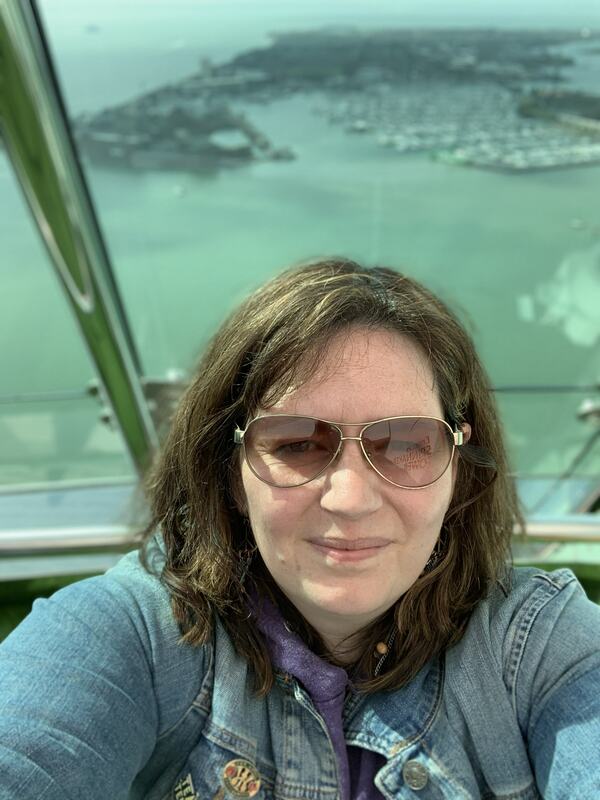 I came up with The Spinnaker Tower I thought the kids would love to see the view and what great photos it would make. But just looking at the pictures made me feel a little queasy I’m not great with heights. On our way there you could see it towering above the city and again I felt a little nervous. The kids were so excited and i thought I just have to go up. We went through the entrance and into the lift. it took no time at all to get to the first floor as the doors opened I could see the view. It was amazing. We continued through the doors and into View Deck 1 There are window all around but I felt completely at ease. 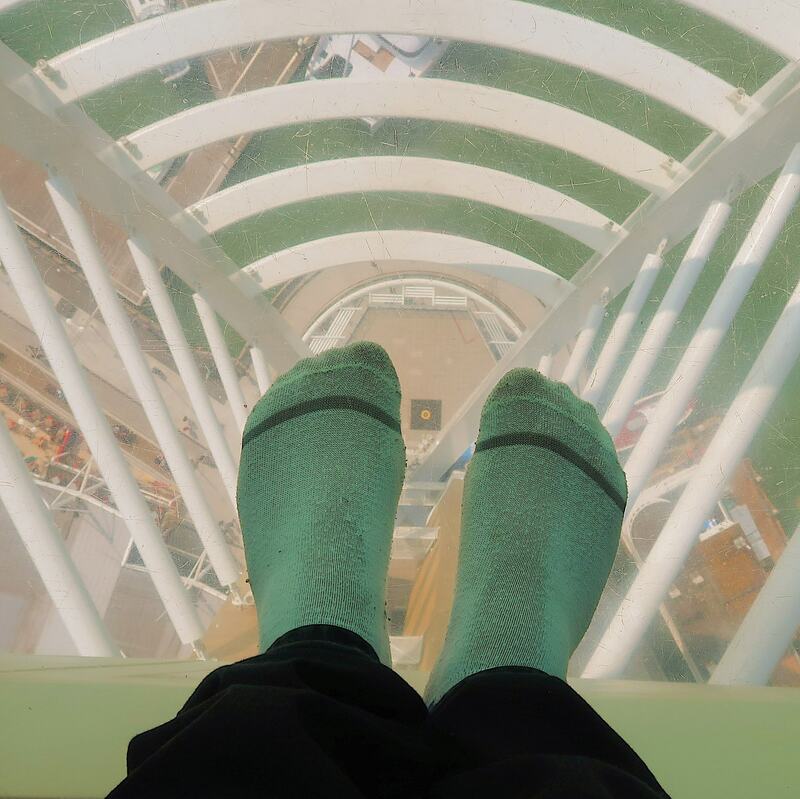 I even hopped (walked tentatively) on the glass floor where you you can peer down to the floor 100 metres below. The kids thought it was great apart from Jessica. Mason however wouldn’t come off it. 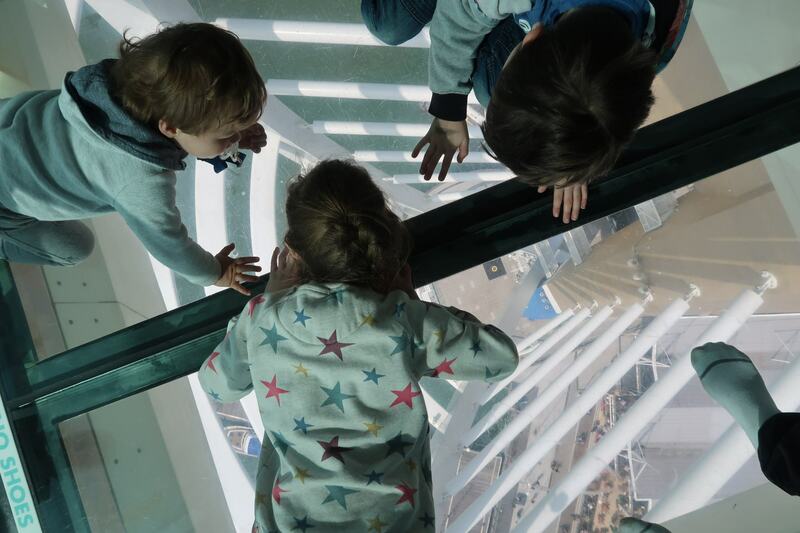 Afterwards we headed up to the top floor via the stairs for an icecream In the Sky Garden! So if your wanting to try something new or need to conquer your fear of heights why not give it a go. 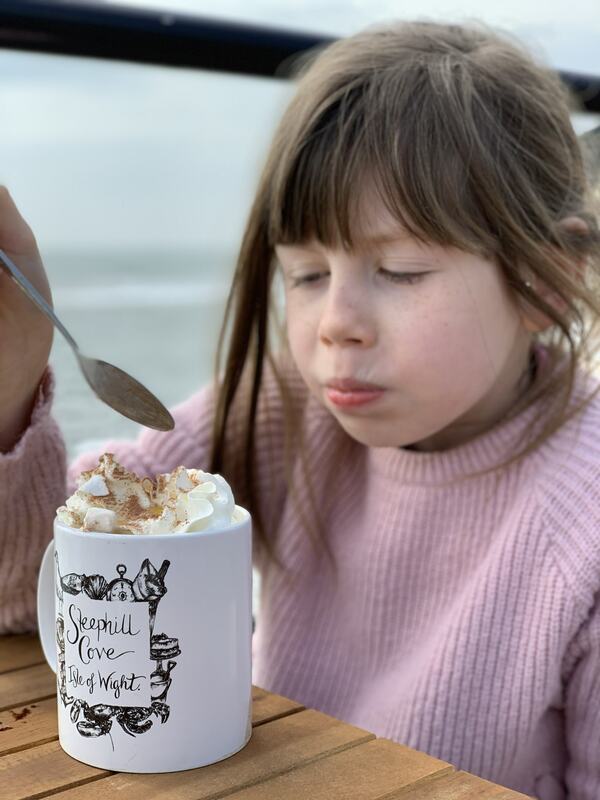 Last week we bundled everyone in the car and took the 200 plus mile road trip to the South Coast where we stopped off at Hayling Island for a couple of nights before heading to The Isle Of wight. This year we are trying to cut back on splurging on lots of things. Sometimes when we are on holiday we can spend pounds and pounds just on eating out and visiting Different attractions! Our biggest expense this trip was fuel! Most of our days on the island were spent by the beach or geocaching. We visited quite a few beaches and coves while we were there. It was the dream. I love beach days. 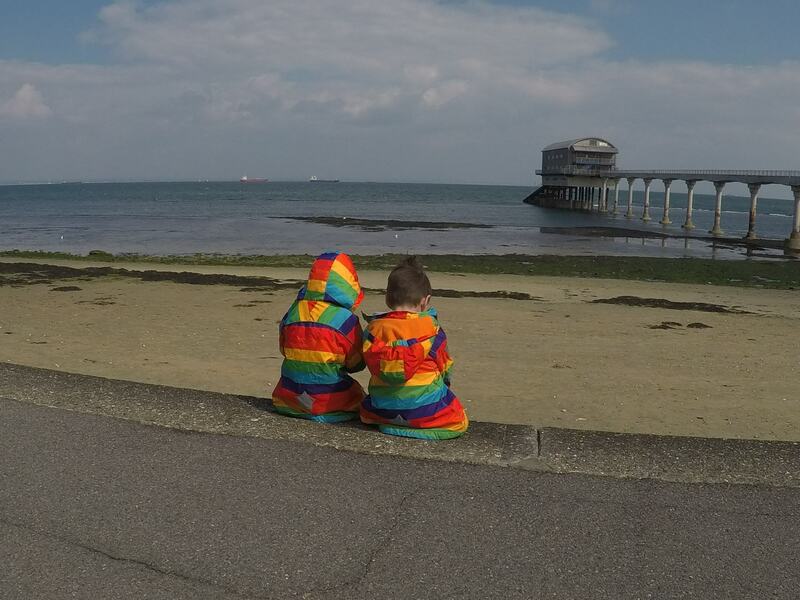 Sandown Beach – This is a beach great for building sandcastles and digging holes. There are lots of lovely cafes and restaurants dotted along too great for a cuppa or an ice-cream. This is the longest we’ve spent at the beach all holiday. The kids loved digging and running to the waters edge to fetch more water for sandcastle building. The little two love rolling around in the sand too. I have to say though the sand is quite yellow (and stains) so dont put your kids in their best white outfits. Ryde Beach – Ryde Beach is the first one we went to its a lovely little beach for playing in the sand. Ryde has lots of amenities and there is even a little play park right next to the beach. 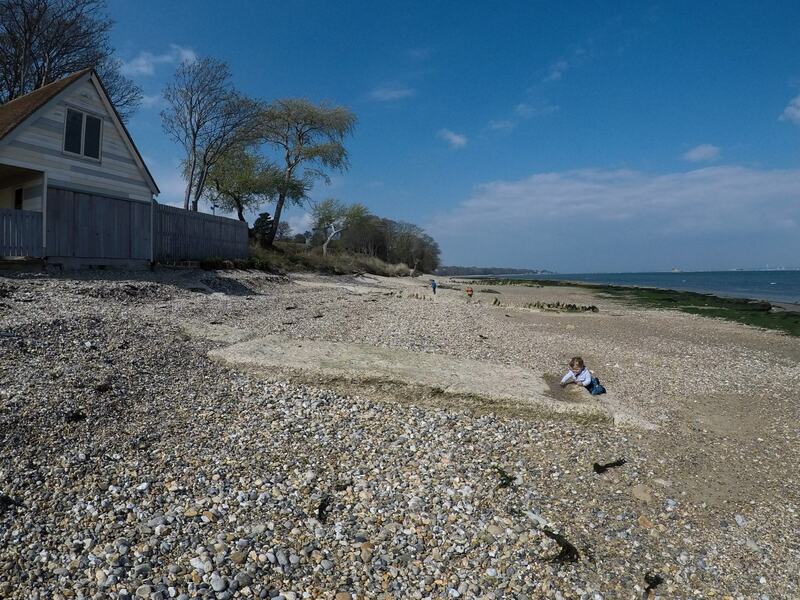 Bembridge Beach –One thing on my bucket list that never got ticked off was a beach breakfast on this beach! Apparently the sunrise is amazing from here with its overhanging trees and driftwood dotted around. again like most of the bays we saw its a pebbly beach. But dont let that deter you from visiting. There are trees for the kids to climb and even my little twin loved playing with the stones. There is the lifeboat jetty to walk down too. 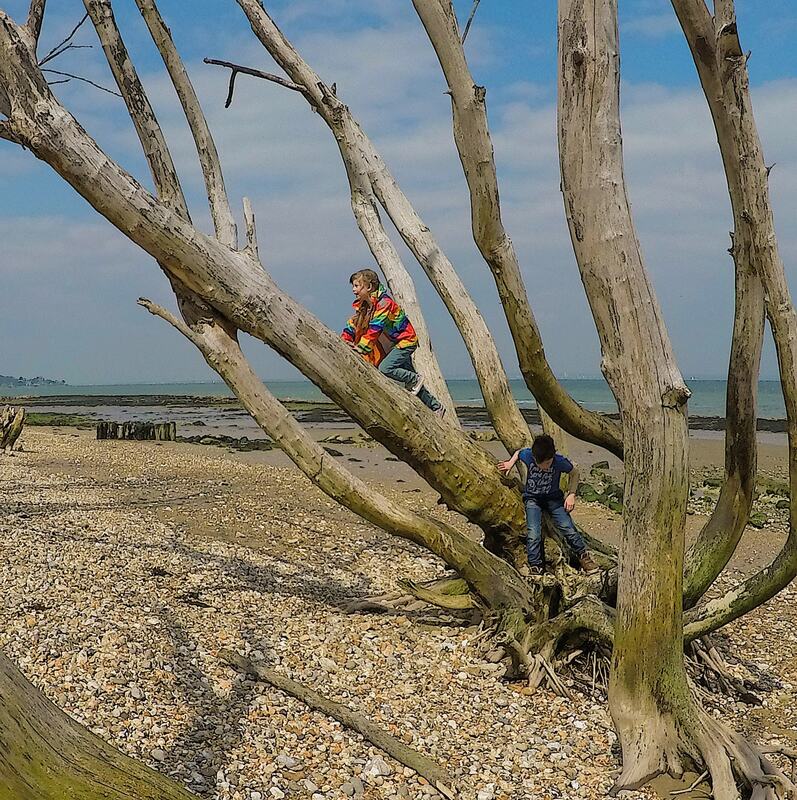 Colwell Bay – This was on my list for one reason only and that was to go for a cuppa at the stylish The Hut. this place didn’t disappoint. 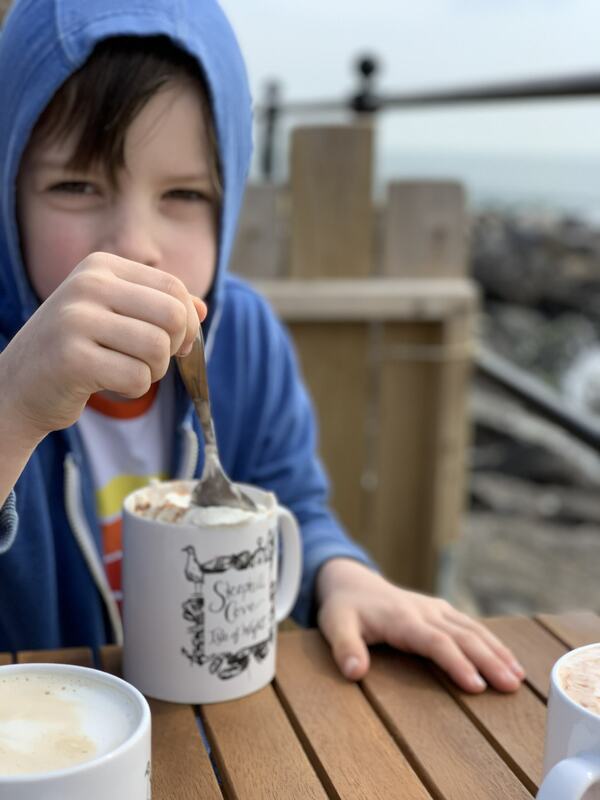 there wasn’t really a beach when we got there but never the less the kids enjoyed playing chicken with the waves and the cuppa we had was very nice I just wish we had gone on a brighter day! Cowes: Although this technically wasn’t a beach me and the big two had a great time learning to skim stones into the sea from a little bit of pebbly shoreline. These are moments I remember from my childhood. It really took me back to my dad trying to teach me as a child. I can still only make the pebble bounce twice. We tried to be as frugal as possible on our trip so each day we packed a little picnic and we would either take it to the beach with us or we would sit in the car parked somewhere with a view and eat it. Of course not all our time was spent at the beach and while the babies had a nap in the back of the car we would have a little drive around looking for Geocaches. This is such a great way to see new places that you probably wouldn’t have visited otherwise. The kids loved looking for treasures. There are loads on the Isle Of Wight too. I will post some of our not so frugal adventures in separate posts over the coming weeks. 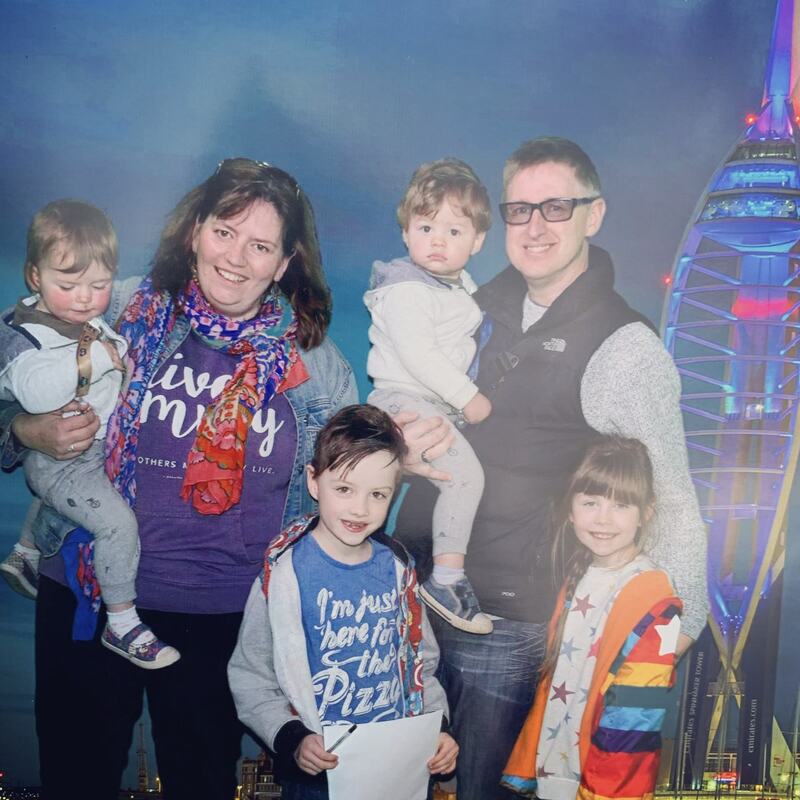 We also visited the Needles, Tapnell Farm park, The Garlic Farm and as I said at the beginning of the post we also visited Spinnaker Tower in Portsmouth before we got to our Isle Of Wight adventure. Have you been to The Isle Of Wight? What is you favourite frugal thing to do on holiday? If you want to take a look at where we went Just scroll in on the map below! There is only just over a week left of School before the Easter Holidays and I got to thinking about what we will be doing during the Half Term. Including out annual family easter hunt! Every year grandma hosts an egg hunt. A couple of days before a set of eggs per child are labelled with their name and on the morning of the hunt they are put out around the garden. sometimes in-between downpours of rain! Then after all the eggs are found and many consumed we have a lovely buffet style tea where we can catch up with family and friends. Its a great day for all of us and the kids really look forward to the egg hunt. Sometimes the most simple things are the ones we remember arnt they. I think we can be guilty of overcomplicating some of the holidays and celebrations throughout the year. We love Christmas for example and if we are not carful we can make Easter as complicated and exuberant as christmas but our egg hunt is such a fun little activity and it doesn’t require loads of stuff. Just lots of work from grandma & grandad who put the effort in sorting the eggs and then creating the delicious food! DO you have a easter egg hunt? What activities do you do in the Easter Holidays? is Easter as big as Christmas is your house? I’ve been think for a while about doing weekly meal plans on here. I’m terrible at thinking of new ideas though and struggle getting healthy meals into my kids. Years ago when I first started blogging I use to partake in something called meal plan Monday. It really helped me to stay on track and plan more. That’s what I need now. We spend far to much money in the local shop for bits and bobs due to not having a plan. Doing this (fingers crossed) will get me back into weekly shops and saving more money. Thursday – Spanish omelette, ham, steamed veg & sweet potato fries. Saturday – Kids – nuggets & chips Adults – cheese board after kids have gone to bed. I’ll try and remember to come back next week. With another Meal Plan. Meanwhile please let me know what’s on your meal plan for the week. Dreaming of…….. a Cornwall Retreat. Literally dreaming. I got woken from an amazing dream a couple of nights ago. Myself & Spencer’s ARC Daddy we’re in Cornwall. I’d fell in love with it. And knowing how much I love to wander around potential new homes he had set up a surprise house viewing. Now before I could go and look around or even finish my coffee in my dream Melody woke me up. But it had me thinking about it all day long. What would our new house be like? Must haves in my Cornwall Retreat – These are a little like my ideal house that I go to in my head when I need a quiet moment a little meditative trick from the Calm book. Green Front Door – I love the look of a pale green door. Sadly mine is an old PVC door and I’m not sure it would look the as good painted green as some wooden ones I have seen. A large open Plan Kitchen and Lounge – I like to entertain and it think its just feels better to have one huge room to entertain I love the idea of having a big island that I can prepare food around while chatting with friends or family. A nice garden overlooking the sea. Maybe a a gate leading to the beach. With places to entertain, a BBQ area and decking. Keeping with the garden I’d love a veg patch and chickens but separate from our main garden. I will also need an office to write in! Im not too fused about the rest of the rooms only ones that are easy to keep tidy and quite simple. The main living area is the most important to me. its where I would entertain, where our kids would do homework or school work, where I could grab a quite cuppa. Maybe this is what my Cornwall retreat would have been like? I love having dreams like that one. Ones that fire your imagination and puts some goal inspiration in front of you! What would your Ideal House looks like? Maybe you already live in it?